This booklet describes in detail the LasrPlay and DVDplay series of synchronizers from Dave Jones Design. These two series of devices are very similar, but have a few differences. Most of what is in this manual holds true for both the LasrPlay series and the DVDplay series. When there are specific differences, they will be pointed out by naming the appropriate series. When the text refers to a "synchronizer", it is referring to both the LasrPlay and the DVDplay. The main difference between them is that the LasrPlay series is designed specifically to work with the Pioneer industrial laserdisc players, while the DVDplay is designed for use with Pioneer's industrial DVD players. These synchronizers are intelligent, programmable controllers for use with Pioneer brand industrial laserdisc and DVD players. Their function is to play a section of a disc (or multiple discs) in a continuous loop. In systems with multiple channels of video, each channel can be programmed to start playing at the same time as the rest of the channels, or be set to play in a loop by itself. This synchronization of multiple images is extremely accurate and can be used to make several channels of video look like parts of a single larger image. These are not general purpose controllers that work with a computer to script a complex show, their sole purpose is to play a single loop over and over again with the channels synchronized to each other. 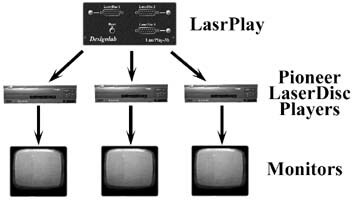 The LasrPlay was originally developed for use in laserdisc based video art exhibitions, and they are installed in museums around the world. Their ease of use and high reliability have been praised by many artists, curators, and installers. Artists and engineers like them because they are so easy to program and install, and curators like them because all they have to do is turn the power on in the morning and the exhibition starts automatically. The DVDplay uses the same hardware design as the LasrPlay but has new firmware for controlling Pioneer's industrial DVD players. Let's take a moment here to understand that there are two different types of "synchronization" happening in some LasrPlay and DVDplay systems, and it is important to understand the difference. The LasrPlay and DVDplay are synchronizers in the sense that they play sections of several discs so that a specific frame of video on one disc starts playing at the same time as a specific frame of video on another disc (or several discs). This is something you can see visually on several monitors playing those channels of video. The other type of synchronization is invisible to the naked eye and requires test equipment to see it, though it can affect the accuracy of the first type. If you understand how video works, you know that the image is scanned onto the monitor starting at the top left corner of the screen and scans across to the right side over and over again, each time a little lower on the screen. The part of the video signal that tells the monitor to start scanning at the top of the screen is known as vertical sync. The part of the video signal that tells the monitor to start scanning each scan line on the left side of the screen is known as horizontal sync. There are a lot of horizontal sync pulses (one per scan line) for every vertical sync pulse. Certain video devices can be fed an external sync signal to force their video signals to start vertically (and sometimes horizontally) at the same time. You can't see this with your eyes, but if the video signals go into a switcher, it may require this type of synchronization. Pioneer's industrial DVD players accept a "black burst" signal to force it's video output to start scanning in sync with other players that also have this signal going into them. Pioneer's 4000 and 8000 series of industrial laserdisc players accept a "composite sync" signal for this same purpose. The 2000 series of laserdisc players do not have the ability to accept external sync. Black burst and composite sync both carry vertical and horizontal sync information to the player, but they are not the same type of signal. The LasrPlay synchronizers are available with an optional composite sync output and the DVDplay is available with an optional black burst output. By feeding these signals to the players you are locking the internal electronics of the players so that the video outputs scan at the same time, and the players internal computers are communicating with external devices at the same time. By using these options you are increasing the accuracy of communication and therefore the accuracy of the start of the playback loops on the players. Without this option the playback will still appear to start at exactly the same time but in reality it may be off by as much as a frame of video (1/30th second in NTSC or 1/25th second in PAL). Most video installations don't require using these options because it is visually hard to detect a frame of video, but the most exacting installations should probably have this option. A typical system consists of a multi-channel synchronizer hooked up to a number of Pioneer industrial players (though there is a one channel version available for times when you only need to play a loop on a single player). Each of the players will be connected to a video monitor or projector. Some (or all) of the players might also be connected to audio amplifiers and speakers. There is no central computer required in this system because the synchronizer has it's own computers to control the players. The cables needed to connect the synchronizer to the players are included with the synchronizer.